You always get a little something more for your money with a Behringer product. In the case of the EUROLIVE F1220D powered monitor, it's a built-in feedback supression circuit. There are dozens of powered moniors on the market, and the F1220D competes across-the-board in every category, but in this one, the inclusionm of a feedback supression system, they are rare if not unique. As far as powered monitors go, this one packs a particularly powerful punch. 250 it's a lot of power, especially considering that its typical application is to be placed six or eight feet in a direct line to the performer's ears. So it's got plently of power, what else? Clarity. The chief function of a wedge monitor is to deliver pitch accuracy and clarity to the performer so he or she can give an evocative, detailed, nuanced performance. With its 3" tweeter, the F1220D delivers crystal clear accuracy and intelligibility. Inside the F1220D active monitor is the equivalent of a 2-way electronic crossover, a graphic equalizer, a parametric equalizer, a mic preamp and a Class-D power amp. A long-excursion 12" driver delivers deep, punchy low end, while the 3" compression driver, mounted in a custom-designed horn, provides ultra-wide dispersion of clean, crisp highs. These systems work together seamlessly, cranking out 250 Watts of super-clean power. Thanks to Class-D amplifier technology, the F1220D provides enormous power and incredible sonic performance in an easy-to-use, ultra-portable and lightweight package. Class-D amplification makes all the difference, offering the ultimate in energy efficiency and eliminating the need for heavy power supplies and massive heat sinks. This amazing technology makes it possible to design and build extremely powerful products that are significantly lighter in weight than their traditional counterparts, while using less energy and protecting the environment. With its 250 ultra-clean Watts of digital output delivered through separately- powered drivers, courtesy of true bi-amping (2 amplifiers per speaker system), the F1220D delivers high-resolution sound that really brings out the best in your music. Powerful, high-efficiency Class-D amplifiers and Switch Mode Power Supply technology coupled with state-of-the-art DSP functionality sure sounds impressive “ but what about the part of the system you actually hear? Behringer' LF (Low Frequency) and HF (High Frequency) transducers are designed specifically for each application. 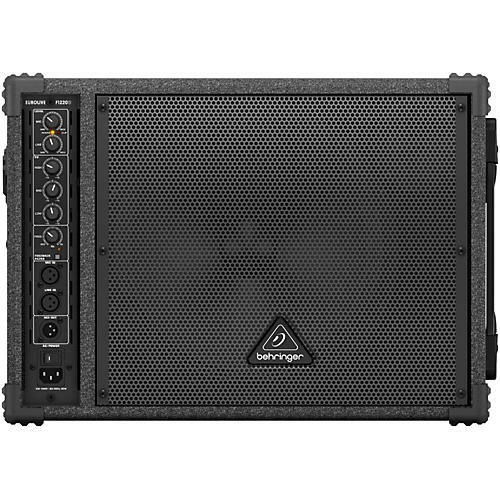 When you buy a BEHRINGER active loudspeaker, the transducers inside have been engineered to perform in conjunction with every other element for professional results. The F1220D doesn™t just sound great, it gives you instant control of your monitor, even during your performance “ something passive monitors simply cannot deliver! Need more volume? Turn the LEVEL dial until the desired volume is reached, getting too much bass or treble? Just reach down and tweak the 3-band EQ (High, Mid, Low) to tailor a rich, exciting sound. We™ve even provided the first line of defense against feedback, a dedicated Frequency dial you can adjust to eliminate troublesome mic squeals. Total control is always right at your fingertips with the EUROLIVE F1220D. You can set up an instant sound system with just one F1220D and a microphone or MP3 player. Thanks to the built-in preamp, you can connect a dynamic mic directly to the F1220D and raise and lower the volume with the Level control. Fast and easy to set up, you can be ready for œshow-time at a moment' notice. There' even a built-in 35-mm socket, so you can mount the F1220D on a standard speaker pole for use as a PA system. And if you need more coverage, chain together as many F1220Ds as you™d like via the convenient XLR or 1„4" TRS Link Output connector. The F1220D can also be used as an onstage amp for keyboards, acoustic guitar, electric violin, etc. You name it “ if it' got either a mic or line-level output, you can connect it to the F1220D. Need a keyboard amp and a vocal monitor, but don™t have the space on stage for both? Use one of our small- format XENYX mixers to sub-mix the Aux Sends from the main mixer with your keys, all into a single active monitor.